Marketing is the process of getting found by the right people, for the right reasons, at the right time. Last week, you learned how to overcome the barriers to getting started by simplifying what is often complex. Today, let’s simplify the process of helping those who’ve found you make a well-informed and reliable decision, painlessly for them and you. If you’ve been marketing consistently, you’ve been communicating through trusted channels, associating yourself with a problem that a specific group of people will experience (unless they turn out to be outliers). A percentage of those recognize the relevance of that problem. A percentage of those will decide they agree with how you describe the problem. They choose to continue paying attention to you. 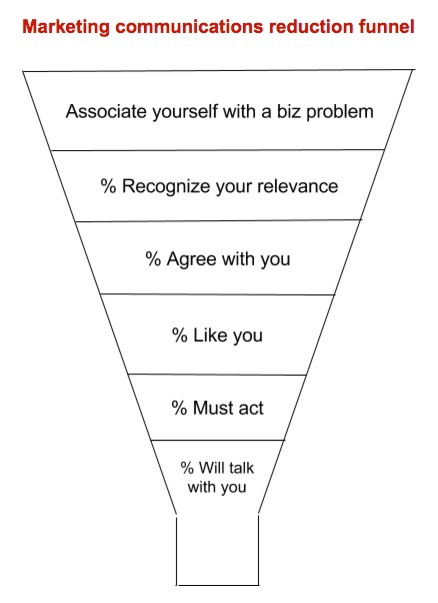 Over time, a percentage of those who like your thinking and follow you decide that they’d probably like you if they met you. A percentage of those reached the point where the problem appeared in their business, and must explore ways to solve it. Because they “know” you, at least in the context of your understanding of the problem and your ideas about solving it, a percentage of those decide to talk with you about it. Congratulations. Your marketing worked. Someone is willing to talk with you about helping them. They don’t want a pitch. (Nobody does. Ever.) They don’t want to hear about your experience and accomplishments. Because you understand the problem, and they agree with your approach to solving it, they’re prepared to believe that you’re qualified. What they really need now is help making a good decision. In this case, “they” is plural. It’s rare that a single person makes a company decision. There are almost always multiple people with a stake in the decision, and a role in making it. However, groups of people don’t know how to make decisions. It’s not an intuitive skill, and everyone struggles with it. Hence, the incidence of “no decision.” In fact, “no decision” is always your biggest competitor. You’ve been there. You met with a prospect. Everything “went well.” Then, weeks later, no response to your follow-up. You’ve worried that they’ll choose a competitor, and they chose to do nothing at all. Another win for no-decision. A group decision is a process that’s usually absent from groups of buyers and sellers because too few sellers have learned it. That’s what you’ll bring to the table, and demonstrate that you’re different. 1) “Shared awareness” You’ll hear a different description of the problem from each stakeholder. That’s because they’re each looking at it through the lens of their concerns, interests, and experience. Until you have agreement on the problem definition, you have no chance to get a decision because they’ll all be deciding something different. 2) “Current State” What are the problem’s practical, concrete consequences? This is what they’ve been talking about since the problem became apparent, so it should be easy. The skill is getting them to describe the consequences in terms that you can visualize. If you can’t see it, you don’t yet have it. Until they agree, a decision isn’t possible. 3) “Desired State” These are the positive, concrete, visualizable consequences they project if the problem is solved. 4) Economic impact. Elicit the perceived positive economic impact of achieving the Desired State. The number will always be really large, and establishes your service as a return on investment instead of a cost. This straightforward discipline is easily learned. It’s also the most powerful skill you’ll learn. 5) Unacceptable consequences. Get a declaration that it’s unacceptable to continue living with the consequences, and forfeiting the positive economic impact. 7) Unsuccessful solutions. Learn what solutions have failed, and why. No sense going down a discredited road simply because you didn’t know about it. Or, you might learn that it was the right solution, but poorly executed. 8) Your solution. Now, they’re ready for your thinking on how to make a difference. Be specific about the “what,” but not the “how.” If pressed for more about the how, be as categorical as you can without losing them. You give away the “what.” The details of the “how” are what you charge for. 9) Next steps. “What do you see as next steps?” Keep it simple, and wait for a reply. Silence is your ally. The important part, and for many the difficult part, is helping them make a decision without trying to engineer the outcome in your favor. As long as they see that you’re focused solely on helping them make a good decision, without regard to your interests, they’ll be candid and forthcoming. The moment they sense that you’re trying to get them to agree to something that’s good for you, but of unknown value to them, they’ll shut down, and shut you out. Remember that your goal is to get a decision, not to get a self-interested decision. The irony is that by subordinating your interest in getting hired, you raise the odds of being hired. If you think about it, isn’t this exactly what you do with a new client? You’re invested in the legitimacy of the client’s decision, not the content of it. All you have to do is extend that same courtesy and respect to prospects.